Bread is the ultimate symbol of the Lammas season. After all, once the grain is harvested, it is milled and baked into bread, which is then consumed. It is the cycle of the harvest come full circle. The spirit of the grain god lives on through us in the eating of the bread. 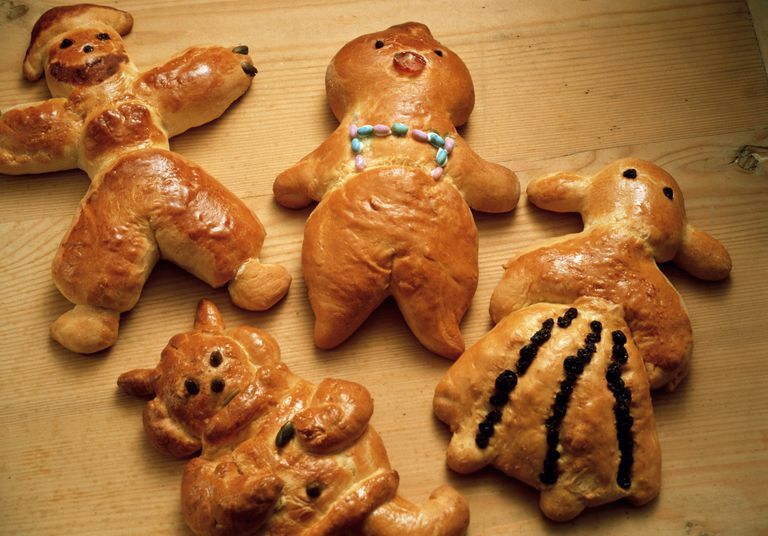 In many traditions, a loaf of special bread is baked in the shape of a man, to symbolize the god of the harvest. You can easily make a loaf of Lammas bread by using your favorite bread recipe - if you don't have one, it's okay to use a pre-made loaf of bread dough, found in the frozen food section in your grocery store. First, prepare your dough according to directions, and place it on a greased cookie sheet. Spray a piece of plastic wrap with non-stick cooking spray or olive oil, and place it on top of the dough. Place the tray in a warm place, and allow the dough to rise for several hours until it has at least doubled in size. Once the dough has risen, cut five slits in it, so you'll end up with a head, arms, and legs. Shape the two lower sections into legs, the side sections into arms, and the top section into a head. Bake the bread for 40 minutes, at about 350 degrees, or until golden brown. After baking, remove from oven and allow to cool on a wire rack. Brush your bread man - or woman - with melted butter, sprinkle with herbs if you like, and use in your Lammas ritual.